The following information will make your trip to art KARLSRUHE quick and easy, wether you are travelling by car, public transport, rail or air. Coming along the A8 from Stuttgart, drive south onto the A5, following signs for Basel. Leave the A5 at junction 48 for Karlsruhe-Süd and follow signs to "Messe“. The road name for satellite navigation systems is Leichtsandstraße (on some systems Leichtsandstrasse) in the Karlsruhe district of Rheinstetten. Tickets for the FareZone 100 apply for travel to the Messe/Leichtsandstraße tram and bus stop when a trade fair is on. change to Line S2 (destination Rheinstetten). You can also take the Messe-Express service for certain events. More information including fares and departure times can be found on the KVV website. All of the timetables of the KVV bus network are available here. Karlsruhe is a hub for ICE, InterCity, EuroCity and InterRegio trains, and is located directly on the Hamburg-Frankfurt-Basel intercity line. The east-west line Karlsruhe-Stuttgart-Munich begins here too. And the high-speed TGV train takes you from Paris to Karlsruhe in just three hours. Karlsruher Messe- und Kongress GmbH has partnered up with Deutsche Bahn to create an exclusive deal that allows you to travel conveniently to and from your Fairs and Congresses. This offer is valid from 2018-Dez-09 until 2019-Dez-14. Karlsruher Messe- und Kongress GmbH and Deutsche Bahn wish you a pleasant journey! * If you would like assistance to complete your booking, click here. If you have any technical questions regarding the booking process, simply call +49 (0)1806 – 99 66 44. Our technical hotline is open every day from 7:30am - 9pm. Calls cost EUR 0.20 from a German landline, and max. EUR 0.60 per call from a mobile network. Hirsch Reisen Company provides a roundtrip shuttle service between Baden Airpark and the Karlsruhe Trade Fair Centre. The City-Shuttle of the Hirsch Reisen Company provides roundtrip service between the fairgrounds and the city centre. The Hauptbahnhof-Shuttle provides roundtrip service directly from Karlsruhe’s main railway station to the fairgrounds. 7 p. m. 7 p. m. 7 p. m. – 1:30 p. m.
You may find the operating hours of the shuttle bus here. Karlsruhe/Baden-Baden (approx. 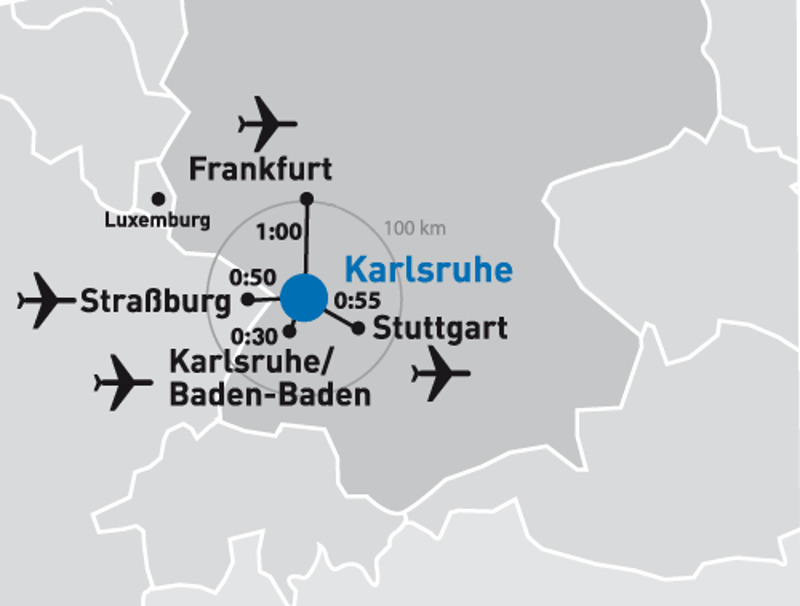 30 minutes by road) and other major international airports such as Frankfurt, Stuttgart and Strasbourg (50–60 minutes by road). A complementary barrier-free shuttle bus service operates between the central railway station and the Trade fair for the duration of the event. More information about getting to the trade fair grounds by public transport can be found here. Information on the KVV’s reduced-mobility itinerary planning is available here, or please call 0721/6107-5886 from 7 a.m. to 7 p.m.